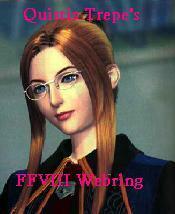 This Quistis Trepe's Final Fantasy VIII Webring site owned by Quistis Trepe. This site of the best Squaresoft site is owned by Quistis Trepe. Copyright (C) St. Evan all right reserved. This Ring of THE RPG LEGENDS site belongs to Quistis Trepe. This Crono & Dekar's RPG Webring site is owned by Quistis Trepe. This Final Fantasy 8 Exchange Ring site owned by Quistis Trepe. This RPG Legacy Webring site is owned by Quistis Trepe. is owned by *Quistis Trepe*. This Official Nanaki Final Fantasy 7 Webring site is owned by Quistis Trepe. This The World is Square Webring site is owned by Quistis Trepe. ThisRedXIII Webring site owned by . This Final Fantasy Webring site owned by Quistis Trepe. Want to join the City of Apollos Webring? This The Salem Circle site owned by Quistis Trepe Quistis Trepe. This Lord Gares Final Fantasy VII Webring site is owned by . This Cloud's Final Fantasy Ring site owned by Quistis Trepe Quistis Trepe. This Honored RPG or Strategy game web site is owned by Quistis Trepe. Want To join? Click Here. This Final Fantasy Players Ring site owned by Quistis Trepe . This Final Fantasy 8 Corner Webring site owned by Quistis Trepe.